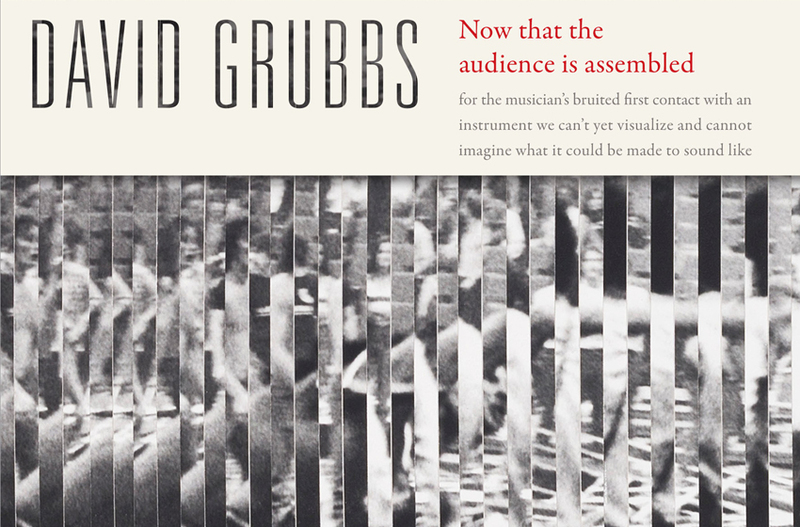 On what will surely be a lovely Thursday evening in April, legendary guitarist David Grubbs will be reading from his new book, Now that the Audience is Assembled and playing solo electric guitar. He will play some new things and pieces from Creep Mission issued by the “Drag City” record label. Also, the High Zero Collectives’ own Shelly Purdy will perform John Cage’s ONE to the power of 4 for solo drummer, and another short work TBA. Grubbs has released twelve solo albums and he has appeared on over 150 commercially released recordings. He was a founding member of the groups Gastr del Sol, Bastro, and Squirrel Bait. He has performed with the Red Krayola, Will Oldham, Royal Trux, Tony Conrad, Pauline Oliveros, and Mats Gustafsson, among others. He is an Associate Professor in the Conservatory of Music at Brooklyn College, CUNY, where he also teaches in the M.F.A. programs. He serves on the board of directors at ISSUE Project Room and is director of the Blue Chopsticks record label. Some words from Critical Inquiry about Mr. Grubb’s previous book, Records Ruin the Landscape: John Cage, the Sixties and Sound Recordings. Durham, N.C.: Duke University Press, 2014. …Crucial to the Cage performance was meant to be its transience. Cage hated the idea of musical “externalization” in what the philosopher Lydia Goehr has named the “imaginary museum of musical works.” He wanted music neither to be ruled by a score (which dictated exactly what should happen each and every time it was performed) nor embalmed in a recording archive. Both would dampen, on his thinking, on the crucial experience of immediacy, spontaneity, and change rung by chance, of rhythm emergent through scale, of deepening absorption on whatever happens to happen, of, as they said in the 1960s, “being there” until the performance, like a human life, simply ceased to exist. The recording was, he felt, a pale replica of this experience of live performance: one incapable of engendering it. Repeated listening to a recording would turn it into a museological occasion rather than a lesson in fleeting intensity. One of the chief joys of this book is that seeks to rediscover the avant-gardes of the 1960s in all their spontaneity, in their present-ness, as if unfolding these mavericks from their own perspectives, without benefit of current hindsight. We learn, reading this book, what the future looked like to the past. Records Ruin the Landscape seeks to prestidigitate the landscape of the 1960s back to life. For this, one should be thankful—including for the recordings that allow David Grubbs’ act of imagination and scholarship to have taken place. -Daniel Herwitz used without permission…thanks! …And his method works. In presenting his more abstract and experimental pieces alongside familiar stylistic concoctions such as the title track and the raga-influenced closer ‘The C in Certain’, he elevated and illuminates them. They are made all the more exotic because everything around them is at least a bit recognisable – in this setting, sound art takes on renewed focus and assumes perimeters, making it all the more effective and memorable. -Barnaby Smith also used without permission…thanks!